Yet ironically in the same verse Allah (SWT) imputes them to have gone astray from the truth! Yet noticeably Allah (SWT) disregards them by stating that they “understand not”. In other words, none of their aforementioned beliefs could make them monotheists; they were still condemned as “polytheists”. This was because although it is important that Allah (SWT) is to be accepted as the Creator, Sustainer etc it is, however, not enough! To become believers of one True God it is important that God’s attributes be not violated, i.e., we should not assign the attributes of God to any of His creatures or vice-versa. This is extremely important to maintain Gods oneness of attributes. However, unfortunately, a lot of communities have stumbled upon this violation of God’s attributes including, sadly, Christianity. Earlier we have documented how Christianity breached God’s attributes thereby violating monotheism itself. It was with regards to God’s humanization in the form of Jesus (peace be upon him). In this paper we would further continue beyond it. Christians provide a number of explanations in defense of their incarnation theory. One of the leading amongst them is the Pauline passage that Jesus (peace be upon him) gave up his divine attributes to enter into humanity (c.f. Philippians 2: 6-8). Although humanization of God is open idolatry yet we are not concerned about it in this paper. We want to look beyond it into areas which are far grotesque than mere humanization! It is interesting to note that John happens to be the only author amongst the gospel writers who has entitled Jesus (peace be upon him) as the “Lamb” (c.f. gospel of John 1: 29, 36); however, this usage of the title is figurative. Jesus (peace be upon him) is symbolized as the sacrificial animal or the “Lamb” to be slaughtered in commemoration of the Passover ritual of the Old Testament. 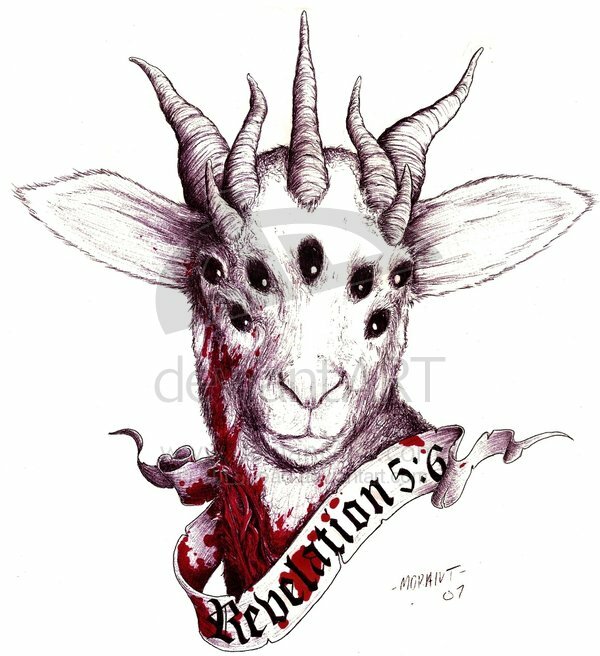 Thus, in the book of Revelation, Jesus (peace be upon him) – the assumed “God” – is morphed from a human being to a weird “seven horned, seven eyed” beast. More interestingly, this mythical creature not just stands on the magnificent Throne of God but also receives “worship” by some of the best Christians! Seven horns – As horn is the emblem of power, and seven the number of perfection, the seven horns may denote the all-prevailing and infinite might of Jesus Christ. He can support all his friends; he can destroy all his enemies; and he can save to the uttermost all that come unto God through him. Christians might interpret seven horns and seven eyes to represent “God’s” divine power and knowledge; however, to any non-Christian monotheist these can only represent bestial (beast-like) qualities unjustly and blasphemously imputed upon God. Furthermore, even if it be accepted for the sake of argument that horns and eyes represent some divine attribute, yet a number of other body parts of a “Lamb” cannot possibly represent any “divine” attribute of God! It is unconceivable in any sensible monotheistic purview that God would transfigure into a mythical “Lamb” and grow horns – in fact seven of them – and seven eyes and stand on the Throne of God with his neck slit and blood oozing out. Given this grotesque portrayal of New Testament “God”, how feasible is it that this was the same “God” which was worshipped by Noah, Abraham, Isaac, Jacob and others (peace be upon them all)? Notice that commentator Lange is not willing to admit, unlike other Bible commentators like Robertson (c.f. Robertson’s Word Picture) [1. ], that the “divine God” took the form of a “dove”. For Lange, it is not “necessary” that whatever descended had “the actual form of a dove”! In fact Lange provides his reasons why “dove” should not represent Holy Spirit. For this reason he is even willing to deem traditional and historical church practice as an “exegetical error”. And we must understand Lange’s tacit uneasiness to accept the more obvious meaning of the statements! It must be enquired as to why Lange faced “difficulties” when Holy Ghost – the “God” – was represented as a “dove”? Why this representation of “God” as “dove” was not “beautiful” enough for Lange but an “unaesthetic treatment”? The answer is quite obvious. No claimant of monotheism can easily accept his/her God be represented as a “dove” without finding other “explanations” out of it! And so Lange “explained”, strangely enough, that the descent of the ray of light is represented by the descent of a dove! Lange is very strangely contended enough to relate the hovering of a dove to the straight downward descent of a ray of light; and we must understand this phenomenon! And subsequently, using animal transformations as apparatus, which is a satanic modus operandi, could have troubled Lange to impute the same on his “God”! If associating partners with Allah (SWT) is unpardonable sin then how saved are the Christians who ascribe bestial attributes to God. It comes extremely unpleasant and grotesque to accept that the “God” of “monotheists” would stand on the Throne with the appearance of a “Lamb” with seven horns protruding his head and an equal number of eyes, and a bleeding neck for people to prostrate “worship” it! How would a “jealous” God (c.f. Exodus 34:14) react when he comes to know that He was compared to a mere “Lamb”, albeit, seven-horned and seven-eyed and a “dove”! Yet if Christians are still monotheists by believing in multiple animal-like “Gods” then we would have to justify why pagans are pagans for their belief. A lot of pagan cults have mythical beasts as their gods and this should not, at least, differentiate them from those who call themselves “Christians”! That is why we adjure our Christian brethren to consider this paper beyond mere apologetics. We request you earnestly to have a talk with yourselves as to how correct is the belief wherein one of the gods of the Trinitarian godhead is said to look like a lamb with seven horns and seven eyes and a bleeding neck and other one resembles a dove! If you are true to yourself then you would agree that there are gross and colossal issues herein with the Trinitarian brand of “monotheism” and that such a description of God can only come out as figments of mere human imagination with nothing divine “inspiration” behind it. Will it then be not be much safer to follow the following Qur’anic injunctions? All Qur’anic texts taken from Yusuf Ali Translation. Unless otherwise mentioned, all biblical texts taken from Good News Edition. We apologize if this paper has offended any sincere Christian believer. It was never our intention to hurt any feelings or jeer any belief. We respect your choices. Nevertheless, we quoted passages which are already registered in the Bible and made our arguments on it. if the hybrid god in christianity was a cat, then christians would argue that the nose represents the power smelling abilities of god or something like that. The entire Book of Revelation is dubious from the get-go. The author was a “John”, not the “John”. Even Christian leaders as late as the 4th century questioned the reliability of this book. Furthermore, the imagery used in the book is probably borrowed from Jewish and Roman sources. An example is the “woman clothed with the sun”. It bears a striking resemblance to the myths about the birth of Apollo.